Kinectimals is perhaps one of the most overlooked pirate games around – mainly because you probably didn’t know it was a pirate game. 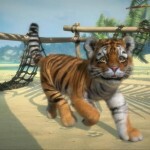 True, the basic idea is “pet the tiger” or “pet the leopard” or even “pet the bear” through the magic of Xbox Kinect, but it also involves the search for pirate treasure on a tropical island filled with ancient ruins. See? Piratey. Of course, it was also pretty heavily targeted at kids, which is why it was such a bold move when they announced the sequel, Farcry 3. 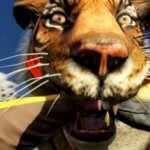 Like its predecessor, Farcry 3 involves tigers, leopards, bears, ancient ruins, and pirates. But it also has a lot more blood. And bullets. And knives. And explosions. No Kinect, though. OK, quick caveat – normally I don’t review things about modern day pirates. 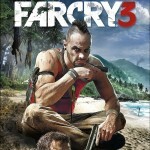 But I’m making an exception for Farcry 3 because awesome. Farcry 3 is actually three games in one. First is the single-player in which you play a tourist-turned-soldier trying to rescue your friends from modern-day pirates. With the help of a wide arsenal of guns and magic tattoos (yes, magic tattoos) you build your strength and skill enough to eventually conquer the chief bad guy. At least, I suppose that’s how it ends, as I’m only halfway through. It’s a vast game in a vast world, and for all the hours I’ve played it I’m not even remotely bored yet, which is really saying something. Also saying something is the insane detail that went into making this world seemingly autonomous. Unlike many games where everything that happens revolves around the player, this island has a LOT going on, and most of it has little to do with you. And then they eat you. Consider – when running through the jungle, you may well stumble across a gunfight between the pirates and the peaceful native population. And if you don’t interfere, they’ll keep on fighting without you, and then go about their days. And while you’re skulking about watching the fight happen, you just might get eaten by a tiger that wandered past and thought you looked tasty. Unless, the tiger saw the pirates or natives first, in which case it might eat them. Unless the tiger just wasn’t hungry, in which case you might never even know he’d just walked past. See? Lots going on. Most of my time in-game has been spent playing story mode, but Co-op is pretty slick as well. And it has an entirely unique storyline of its very own. In co-op, you’re one of four pirate-attack survivors from a passing cruise ship. They each have a shady past, and each their own special skills with weapons. 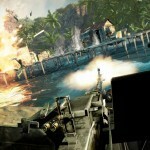 Working your way across the island with your Xbox live buddies alongside is brilliantly fun, although very challenging. Having played with only 2 of the 4 possible team-members, it quickly got TOO challenging. But with 3 or 4 I’m sure it would pretty genius to play. Full-on multiplayer is something I’ve only barely dipped my toe into, and I found it laggy and buggy. Word has it this is common, although my crap router is surely part to blame. I hope to play more multi soon, but for now story mode and Co-op are more than enough to keep me busy. So yeah, Farcry 3 is awesome. If you like this sort of first person shooter and dig pirates of the modern-day variety, definitely check it out. I found the controls much easier that similar games – and unlike Black Ops I can actually hit what I aim at, which really is the gift that keeps on giving. This entry was posted in Games by Bilgemunky. Bookmark the permalink. Who knows what DLC will be offered. Perhaps if we raise a voice, we can play as Blackbeard taking down modern pirates?? ?